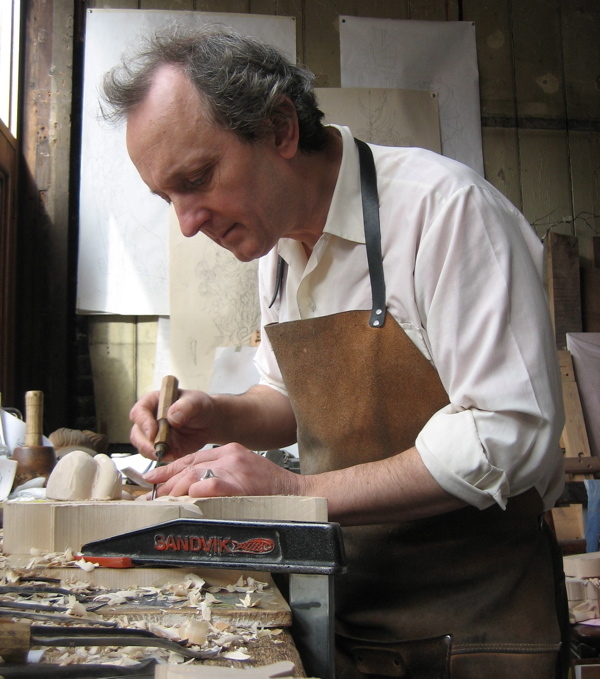 Hugh Wedderburn works every day carving wood in the window of an old shop in the Borough at the meeting point of two Roman roads, Stane St and Watling St. “The ancient approach to London,” Hugh delights to call it, aware that the nature of the work he does has not changed significantly in all the time these roads have been there. Fifty yards behind Hugh’s workshop, a fourth century Roman tablet was found recently that includes the earliest known usage of the name “London.” It gives Huw pleasure to contemplate these things, savouring his position at the centre of this age-old neighbourhood. While the world races by Hugh’s window, and as the acorns in pots on his bench grow up to become trees, he patiently shaves away superfluous pieces of wood to reveal elegant forms of creatures and foliage, that were just waiting to be uncovered by his keen tools. Or rather, that is the way it seems, because the quality of Hugh’s carving has such natural veracity and grace that it belies the immense skill and laborious application it takes to bring it into existence. “The chisel makes the shape,” said Hugh, as if his involvement as woodcarver were merely incidental. “So you have to have the right chisel to make the form, and you need to have them in various bent shapes to do the awkward bits.” he added, referring to a handsome array of fifty diverse old chisels laid out in a crescent upon his bench surrounding the current piece of work, all perfectly-sharpened and interlaced with shavings. 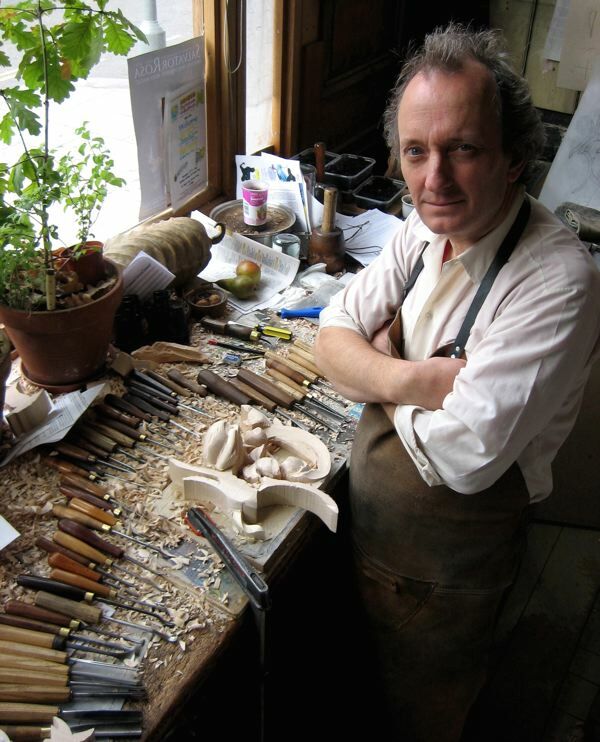 With these, Hugh can create the extraordinary intricate relief carving of baroque swags, flourishes and foliage that stands proud of the surface and defies the imagination to comprehend how mere mortals could carve it. “I felt like I was coming home when I moved here to the Borough in 1996,” confessed Hugh brightly, peering out the window at the passersby in Tabard St,“because I was born in Nigeria and there are quite a lot people in Southwark from Nigeria.” In 2001, Hugh was contacted by Margaret Wedderburn Evans who told him they had a common ancestor in Robert Wedderburn, born in the West Indies in 1762 to a Scots’ father and a Jamaican mother. A campaigner against slavery, he came to London and joined the Spencerians, an English radical group that united the working men’s cause. Today, Hugh’s ancestor is remembered for slogans such as,“It’s demeaning for the oppressed to petition the oppressor,” and “You can take away my weapons but I can still spit.” Sentiments that Huw quotes with relish and a gleeful smile. “I am the answer to the question of what happened to the first Afro-Caribbeans that came to London,” he said, holding up a lithe forearm to display his pale flesh. “Look, that’s what happened to them,” Hugh declared enigmatically, indicating that his perception of the world has a depth and complexity comparable to his work. When Hugh moved into his current workshop it had been a betting shop, but when he pulled out the shopfittings he found old matchboarding, now covered with organised lines of tools that form the background to his crowded yet harmonious work space. Sunlight pours in through the shop window, and filtered through the saplings in pots on Hugh’s work bench, it casts a soft light upon all the bits and pieces of work in progress, souvenirs of past works, cases of books and catalogues, working drawings, sculptures, driftwood and twigs. I was fascinated to examine Hugh’s first table and see the marks of the chisel still fresh upon this bravura work. Without the varnish, staining and gilding that you expect of old furniture, it had another quality, and the clarity of the expressive wood carving came into relief. 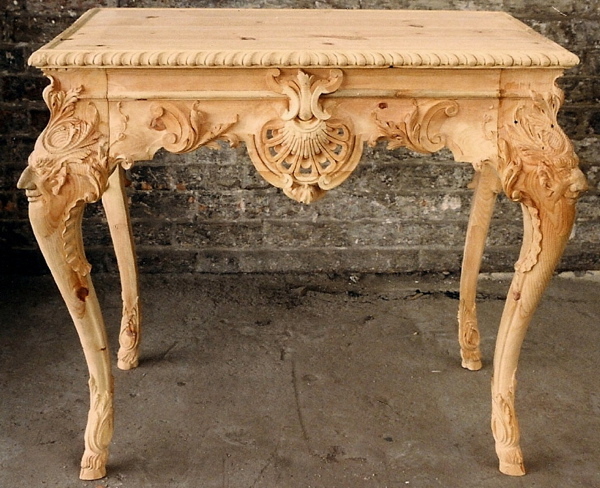 “There’s a snobbery about whether you’re an artist or not, as a woodcarver, because it’s a collaborative art,” mused Hugh, while I squatted down to admire the details of his extraordinary table,“but a musician interprets a composer’s work and that’s collaborative, yet it is not seen to compromise their integrity as a fine artist.” It was an interesting question, but not one to trouble Hugh very long because it was time to return to the bench and his current work. 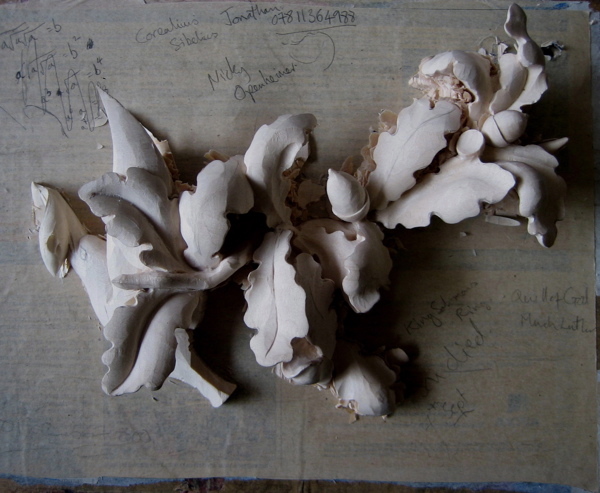 Hugh started carving, making deliberate, slow confident strokes with a sharp chisel in absolute physical concentration, and a transformation came upon him. The man who had been so upbeat in conversation – flashing his startling grey eyes – was gone, and different, quieter, energy filled him. The clamor of the city retreated, the sound of Hugh Wedderburn’s wood carving was the only sound, and peace reigned. This was Hugh’s first table. Hugh’s current work-in-progress, these acorns are a detail from a larger composition. 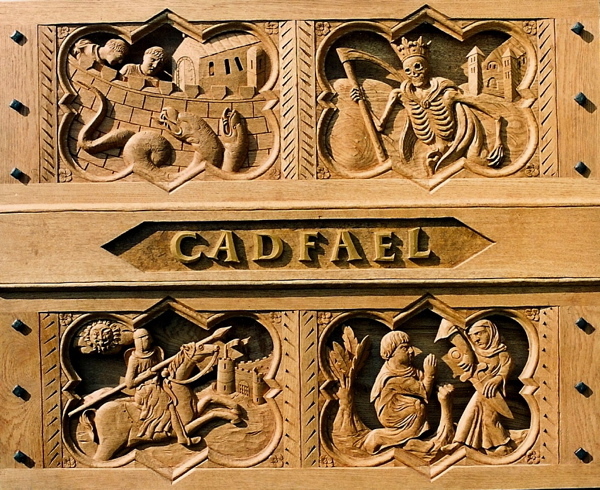 The title panel for the Cadfael television series, carved by Hugh in oak. Work in progress upon a mirror frame by Marianna Kennedy sits upon the bench in Hugh’s workshop. Yes, it does. It’s the faces, and the little hooves. Beautiful. I wish I was rich, just so that I could buy a piece from Hugh. 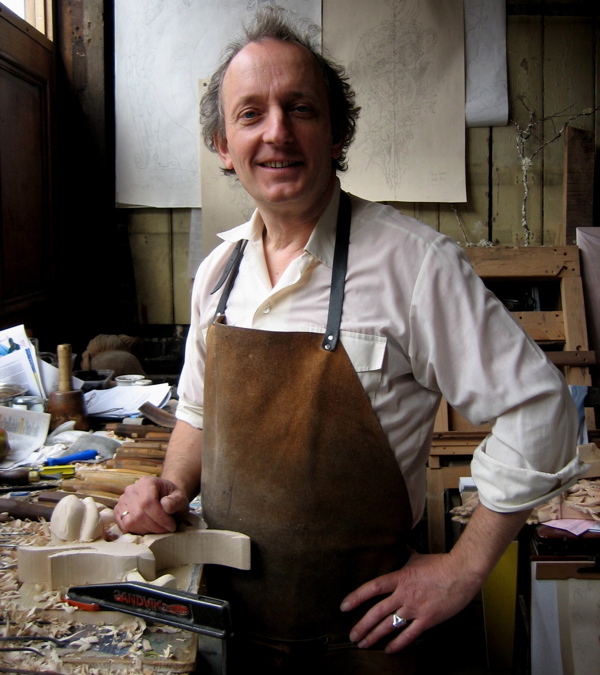 Hugh, Quite pleasing to a Old London Gunstock Maker, to see someone who can use Traditional hand tools and is in the “City”. Very nice work ! dt. We love the Cadfael series and have always been intrigued by the opening woodcut. 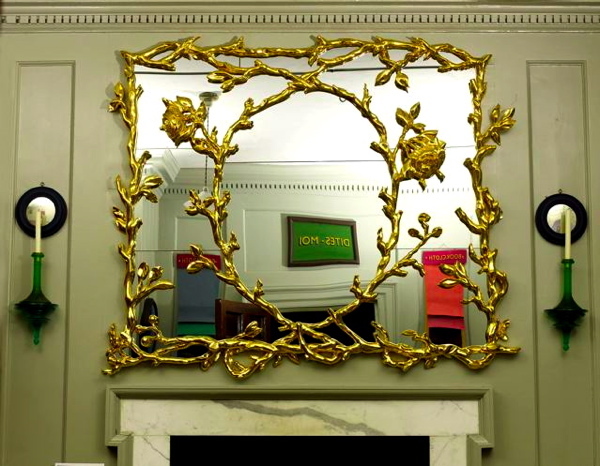 Can you give any details on what the panels represent? Hugh! Would love to see. I will stop by at Christmas will you be there? Your work is getting better and better! I am certain you are as well. A big hello to Danuta, my best to you and yours! My father, who was a furniture maker, loved to say of woodcarvers, “the good ones have conquered the third dimension”, meaning depth. Some carvers hesitate to remove material and it shows. It is grand to see that you have indeed conquered that third dimension. Especially love the Cadfael’s piece. Well done! The table and mirror frame are magnificent. Hugh may not be a millionaire today – but can you imaging what his pieces will sell for as antiques a hundred years from now? Wish I could afford one! stunning! so pretty and dazzling! you are the best one nothing to write already your work tells your uniqueness. I have avery very aim and beginner talent to work carving . if i gate the opprtunity to work in your site am lucker man. In the Mirror by Marianne Kennedy is a framed motif,Dites-moi .why would someone put the title of a song From “South pacific “on the wall? Tell Me indeed. 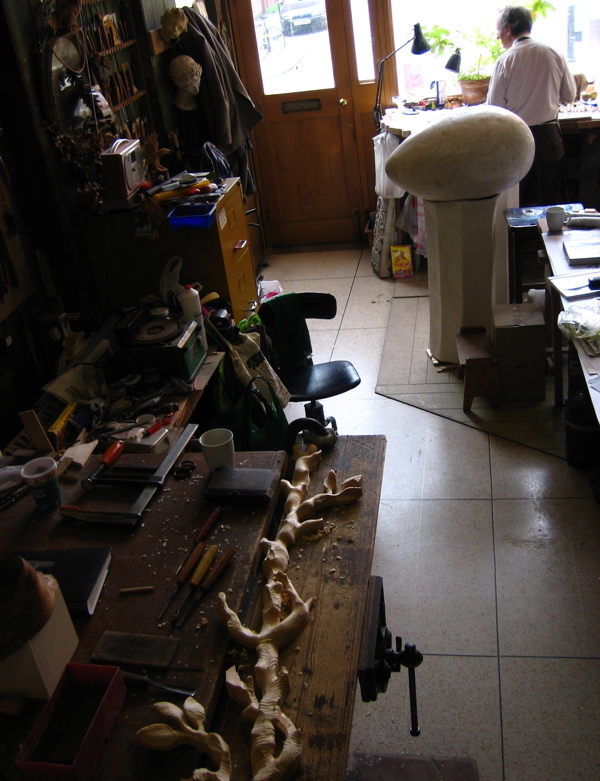 and that is a pretty big egg in his studio,How big is the chicken ? I found the shop on google maps… ( I knew Tabard St because I had my first job in Long Lane in 1974) pYou can see the little oak trees in pots in the window. Truly a man after my own heart. I have been involved with london trees now for over fourty years and love planting acorns, just wish I could carve wood like our man in Tabard St! I just LOVE your work. We need a very simple memorial for our beloved son who died very bravely thinking of what he could do after his death on Feb 6. I am a wood person. We already have what seems to me a suitable chunk of walnut. But maybe it is too well-seasoned for you? Our dear friend, Ian Walters, who did the statues of Nelson Mandela, who died some years ago, told me that he liked to work with green wood. I don’t believe I have ever seen anything so beautiful and evocative as your work in Cadfael. I wait for it at the beginning of every film I watch again and again and always wish I could see more of it. Thank you.